Available in a number of colours the Vagos bar stool from CLP is a fixed height purple breakfast bar stool that will add a touch of style to your breakfast bar or table. The stool features 4 robust stainless steel legs and has a foot rest at the front to make the seated position more comfortable. 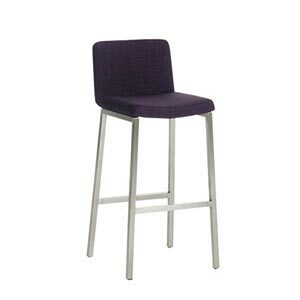 The seat of the purple kitchen bar stool is made from tweed fabric that is 100% Polyester. If some of the more vibrant plastic looking kitchen stools and chairs are not your style then the less saturated colours of the Vagos bar stool should be right up your street. CLP appear to be a high quality company that are capable of of producing very comfortable bar stools for a range of environments in a range of great colours. Check out more of the CLP breakfast bar stool range in our kitchen chairs and stools category!